A tsunami could strike the San Diego coastline with as little as a few minutes warning and cause catastrophic damage to low-lying areas like Coronado, Del Mar and neighborhoods surrounding Mission Bay. That was the reminder issued by state and local officials Thursday, who gathered at La Jolla Shores Beach, another area that would be inundated, to publicize the upcoming Tsunami Preparedness Week. “With 70 miles of coastline here in San Diego, it’s very important for San Diegans to have a realistic understanding of the danger,” said Mike Davis, senior emergency services coordinator for San Diego County. He said warnings can vary from “several hours to just minutes,” and the best thing to do is move quickly inland. Detailed maps of areas that would be inundated are available online as is information about how to prepare for a tsunami. If a tsunami is likely, the National Weather Service’s Emergency Alert System will issue automated advisories or warnings on television, radio and in come cases on smartphones. “If you are at the beach during a tsunami advisory or warning, it’s best to go inland immediately,” said Alex Tardy, a meteorologist with the weather service office in San Diego. 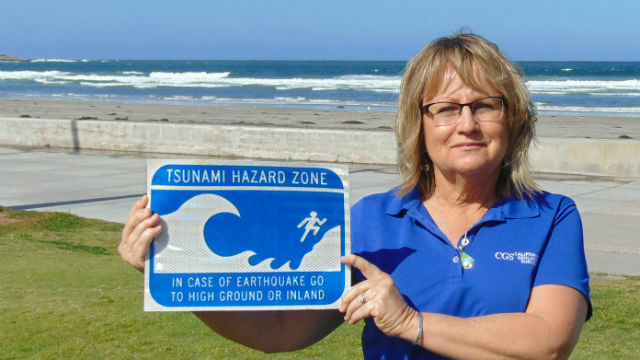 Cynthia Pridmore of the California Geological Survey said the state has been hit by some 100 tsunamis over the past 200 years with 13 doing grave damage. “These are infrequent events that can have catastrophic consequences,” she said. Tsunamis can be caused by local or distant earthquakes and underwater landslides. They don’t create waves, but rather an ocean surge that is impossible outrun if you’re caught on a beach. The last tsunami to hit San Diego was sparked by a 2011 earthquake in Japan. The ocean surge that came 13 hours later caused $3 million in damage around Mission Bay, said Lt. John Sandmeyer of San Diego Lifeguard Services.